I can honestly say that Abe Simpson from The Simpsons got me drinking this Moxie Stuff. I've always been eager to try new foods, within reason. Sushi is not for me, it just reminds me of Bait. But if it's cooked, not too spicy, not too fried, sure, it's a meal not a life commitment. I was watching an old Simpsons rerun where Abe Simpson was saying that someone really had Moxie and chuckled. It was the kind of thing that people who were older than me said. Usually quite a bit older. The saying really isn't used much any more. Dad would use Moxie once in a while, and it got me thinking what did it really mean. It turns out that it was an Advertising slogan. 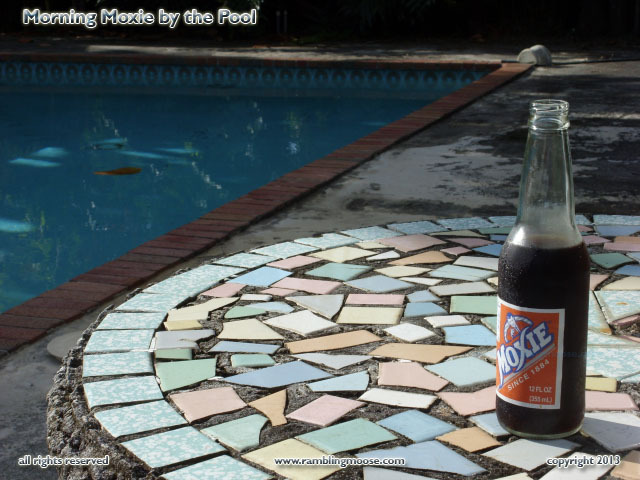 Moxie was the Cola Drink that Coca Cola and Pepsi had to unseat before they could battle for number one and number two in the market. Moxie faded away in the pre-WWII years and was a shadow of itself in the 50s. I never had any of the stuff until I got here in Florida. If you want it at this point you have to be in Florida, Pennsylvania, or New England... roughly. Coca Cola and Pepsi just taste sweet to me, no real flavor, just sweet. Why bother, especially at 150 calories a can or more. Diet Coke and Diet Pepsi were the same, but with the wonders of the chemical black arts. Choose your poison, High Fructose Corn Syrup or Aspartame. While walking through the boutique-y Fresh Market in Fort Lauderdale, I spotted the "Weird Soda shelves" as I called it. Remembering Grandpa Simpson I chuckled as I grabbed the bottle of Moxie and placed it in the cart. After it got home, I found a new friend. Flavor. No longer was I drinking the Bachelor Chow of Sodas. Moxie tastes similar to the Bottle Cap cola candies we all had when we were wee brats. There's a slight bite to it from something called Gentian root. It's supposed to be a stimulant, this Gentian root, and it is supposed to have a bitter tang. It doesn't really taste bitter to me, but I'm a heavy coffee drinker so I doubt it would. It's not something I have every day, any kind of sugared soda, but I did realize that the other morning I walked the bottle outside and that isn't something I generally do with the coffee. Chasing the dog around the back yard with a bottle of Moxie sweating in the early morning Florida sun by the pool. Not a bad way to start the day. My step father drank Moxie and used the phrase as well. Memories, ha, my eyes glance occaisonally to the beverage, however, I'm mot a soda drinker.